What happens if I play Way of the Bear on a creature that already has an Assault keyword on it? If a creature with the assault (X) keyword gains another instance of the assault (X) keyword, the two X values are added together. How does assault damage work against Elusive creatures? 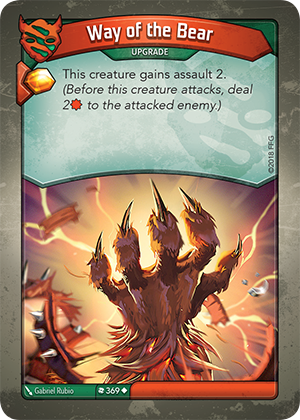 Assault damage takes place before the actual fight and can be used to harm/kill Elusive creatures that are attacked, even if that creature has not been attacked this turn. Can I play Way of the Bear on an enemy creature, allowing me to gain the Æmber bonus? Yes. The first step in playing any card is to receive the Æmber bonus, if any. Then, unless otherwise stated, an upgrade can be played on any creature, including enemy creatures. Therefore, you could play Way of the Bear on an enemy creature to receive the Æmber bonus. If there are no creatures in play, can I still play Way of the Bear to gain the Æmber bonus? No. If an upgrade (such as Way of the Bear) cannot attach to a creature in play, the upgrade cannot be played. Therefore, you could not play Way of the Bear if there are no creatures in play and no Æmber bonus could be gained.